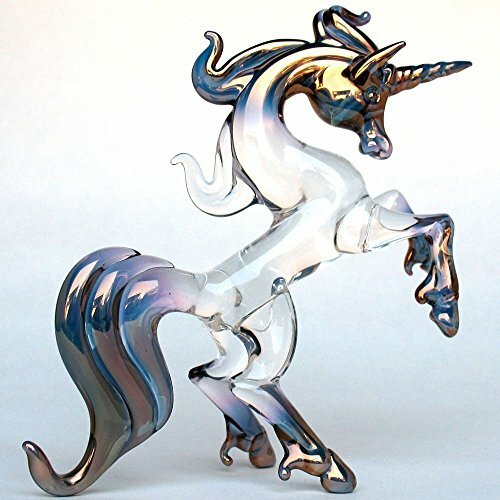 Hand blown glass unicorn figurine just might be your favorite collectible crystal sculpture. Kevin Prochaska, Disneyland glass blower for 10 years is the artist. Rearing proudly in a classic pose is this stately hand crafted unicorn figurine. Sculpture is a must for every unicorn collector. It measures approximately 4.5 inches long, 4.5 inches tall, and I make it entirely from borosilicate crystal and 24k gold. The brilliant rainbow of colors is created when I apply pure gold to the glass while it is still molten. Your purchase includes an attractive information card trimmed with gold foil, making this a thoughtful and unique gift. If you have any questions about this product by Prochaska Gallery, contact us by completing and submitting the form below. If you are looking for a specif part number, please include it with your message.